Multiple murders with one grisly connection have Detectives Tom Stone and Jake Sharpe pursuing every lead. Their main suspect, Anthony Angelino, fresh out of prison, dreams of building a new empire, but his past quickly catches up to him and once again he is on the run from the police, and the drug cartel that tried to ruin him. The head of the cartel, Frank DeVito, using his vast resources puts a tail on Stone hoping the Detective’s investigation will flush out Angelino. Then he can exact his revenge and claim what he says Angelino has stolen – a large shipment of pure cocaine. Angelino’s girlfriend, Sara, caught between right and wrong, pleads for him to escape the deadly lifestyle. As the body count rises, Stone, grappling with his own questions and answers, confronts the challenges in his relationship with Alisha Davidson, Angelino’s defense attorney. 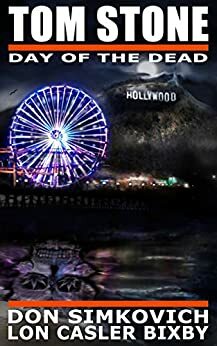 Halloween dramatically twists into Day of the Dead celebrations on Santa Monica pier as cocaine’s promised riches weave a tale of bloody betrayal, shattered friendships, and loves both lost—and won. ‘Tom Stone: Day Of The Dead’ is the third in the bestselling series featuring Detectives Tom Stone & Jake Sharpe. I must admit that I haven’t read the previous two books in the series but if there’s one thing I like, it’s discovering new authors and new series’. I read the synopsis for ‘Day Of The Dead’ and I was immediately intrigued. I started reading the book as soon as I could and I am so glad that I did because I loved it but more about that in a bit. I have to admit to developing a soft spot for Detective Tom Stone. He seems to be the book equivalent of John McClane from the Die Hard movies. No matter how sticky the situation or the pickle you find yourself in, you know that with Tom Stone around things are going to be ok. Tom Stone is an ace detective who is one of the good guys. He’s tough on those who commit crimes and tough on the causes of crime. Stone and Sharpe find themselves having to investigate a series of murders which have certain similarities and which point to the same man being guilty- Anthony Angelino. Angelino has just been released from prison and is trying to build a new empire but he has seriously peed off the head of a major drug cartel who is desperately trying to find Angelino and make him pay. He puts a tail onto Stone in the hope that Stone will find Angelino and he can then take over. However there’s a major complication with the fact that Stone is seeing the defence attorney of the main suspect. The investigation has the potential to turn very messy indeed. The authors have a writing style guaranteed to draw the reader in from the first word on the first page and before you know it you are addicted to the characters and to the story. That’s what happened to me anyway. The story definitely hit the ground running and maintained the pace throughout the book. As I took such a shine to Detective Stone, I just had to read on and on to find out what fate had in store for Stone and if he managed to solve the case. The more I got into the story, the more I read and the quicker the pages turned. The book itself isn’t particularly long. I was a bit concerned that the plot might be too complicated to be completed in such a short book but I needn’t have worried because the plot was nicely done and dusted within the short number of pages. Reading ‘Day Of The Dead’ was much like being on a scary and unpredictable rollercoaster ride. Just when you think that things had settled down and you could gather your breath, then off things would go again. There were moments where I almost had to read through my fingers because I genuinely feared what was going to happen next and how that affected Tom Stone. In short I loved reading ‘Tom Stone: Day Of The Dead’ and I would definitely recommend this series to other readers. I can’t wait to read what comes next from these two authors and here’s hoping that we don’t have too long to wait. In the meantime I will be buying the previous two books in the series and reading them just as soon as I can. The score on the Ginger Book Geek board is a well deserved 5* out of 5*.